William George Sartin was born in Yeovil in 1890, the son of Company Sergeant Major William John Nicholas Sartin and Dinah Rose. William was in the Royal Engineers and consequently the family moved around quite a bit with his regular postings. William and Dinah's next two children, Albert (b 1893) and Kate (b 1895) were both born in Gravesend, Kent, while the next three children, Annie (b 1896), George (b 1898) and Charles (b 1900) were all born in Chatham, Kent. In 1900 the family moved to Monmouth, Wales, where son Richard was born in 1900. The 1901 census listed the family at Derwen Cottage, Waterly Lane, Monmouth. As a sidenote: William John Nicholas Sartin was the son of John Sartin once landlord of the Globe Inn, Park Street and brother of Edward Sartin also landlord of the Globe Inn, while Dinah Rose was the daughter of George Rose once landlord of the Swan Inn, Park Street. William Junior clearly enjoyed the military life and, like his father, he too joined the Royal Engineers, enlisting at Monmouth - probably when he turned 18 in 1908. In the 1911 census 21-year old William was listed as a Sapper in the Royal Engineers with the trade of Shoeing Smith. He was in the Army's Connaught Hospital, Marlborough Line, Aldershot. William was in the 23rd Field Company of the Royal Engineers (Service No 18363) and by the time war broke out he was a full Corporal with the trade of Shoeing and Carriage Smith. The 23rd Field Company, Royal Engineers served with 1st Division during the Great War. 1st Division was one of the first British formations to proceed to France in August 1914, and fought on the Western Front throughout the war, taking part in most of the major actions. In 1914 they were involved in The Battle of Mons and the subsequent retreat, The Battle of the Marne, The Battle of the Aisne and the First Battle of Ypres. William would have been in all these battles. The Battle of Mons (23 August 1914) was the first major action of the British Expeditionary Force (BEF) in the war. It was a subsidiary action of the Battle of the Frontiers, in which the Allies clashed with Germany on the French borders. At Mons, the British Army attempted to hold the line of the Mons–Condé Canal against the advancing German 1st Army. Although the British fought well and inflicted disproportionate casualties on the numerically superior Germans, they were eventually forced to retreat due both to the greater strength of the Germans and the sudden retreat of the French Fifth Army, which exposed the British right flank. The First Battle of the Marne (5–12 September 1914) resulted in an Allied victory against the German Army. The battle was the culmination of the German advance into France and pursuit of the Allied armies which followed the Battle of the Frontiers in August, which had reached the eastern outskirts of Paris. The counterattack of six French field armies and the BEF along the Marne River forced the German Imperial Army to abandon its push on Paris and retreat north-west, leading to the "Race to the Sea". The Battle of the Marne was a victory for the Allies and set the stage for four years of trench warfare on the Western Front. The First Battle of the Aisne (13–28 September 1914) was the Allied follow-up offensive against the right wing of the German First Army (led by Alexander von Kluck) and the Second Army (led by Karl von Bülow) as they retreated after the First Battle of the Marne. The offensive began on the evening of 13 September, after a hasty pursuit of the Germans. The First Battle of Ypres, also called the First Battle of Flanders (19 October – 22 November 1914), was a First World War battle fought for the strategically important town of Ypres in western Belgium in October and November 1914. Sadly William was wounded in the battle and died from his wounds on 2 November 1914. He was 24. For his service in France he was awarded the 1914 Star. The 1914 Star, the British War Medal and the Victory Medal were commonly known as 'Pip, Squeak and Wilfred' and were the three most common medals of the Great War. The 1914 Star, known as 'Pip' was a bronze medal, about 378,000 were issued to those who served in France or Belgium between 5 August and 22 November 1914. Mainly Regulars or Territorials, a few land based Navy, and a few Australian and Canadians were the recipients. The central scroll carries the dates for the 1914 Star. 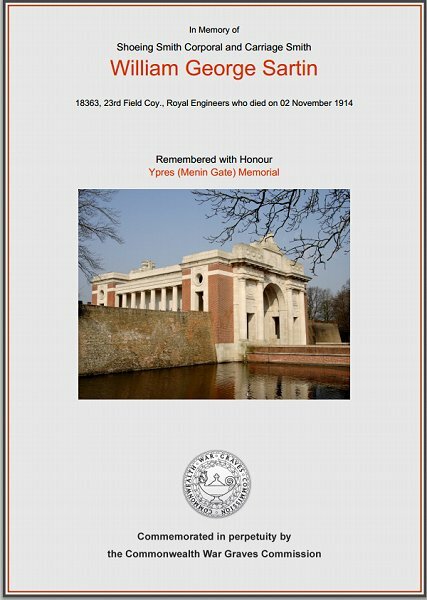 William Sartin is remembered on Panel 9 of the Ypres (Menin Gate) Memorial at Leper, West-Vlaanderen, Belgium. His name was added to the War Memorial in the Borough in 2018. The Commonwealth War Graves Commission certificate in memory of William Sartin.